Non-traditional students make up most degree-seekers in the U.S. and include students who are returning to college after dropping out or transferring, working adults who need flexible options as well as professionals who want to use life experience as college credit. Find out which schools are best for non-traditional students seeking a Construction Management degree! 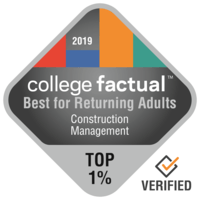 Below you'll discover a ranking of the best Construction Management universities and colleges for returning adults. These schools are included because of the support they offer returning adults, as well as the quality outcomes offered to Construction Management grads. Read the full methodology for more information. Pursue your dream job with a degree from Wentworth Institute of Technology. In addition to its bachelor's programs, Wentworth Institute of Technology offers graduate degrees in Construction Management. Boston, Massachusetts is an ideal location for students who get pleasure from the fast-paced city life. Many WIT freshmen are given scholarships. You may want to study extra hard for your SAT; the average score of applicants to WIT is 1,115. A virtual tour may be a good way to explore Wentworth Institute of Technology. It's difficult to beat Arizona State University - Tempe if you want to pursue Construction Management as a major. In addition to its bachelor's programs, Arizona State University - Tempe offers graduate degrees in Construction Management. Tempe, Arizona is the perfect location for college students who appreciate the fast-paced city life. Students from outside the U.S. don't have to worry about sticking out since 13.0% of ASU Tempe's students come from other countries. Student success after graduation is significant to Arizona State University - Tempe, and graduates typically leave the university with student loan debt much lower than the national average. Watch some school videos to learn more about what's happening on campus. Virginia Tech is a great option for students pursuing a Construction Management degree. In addition to its bachelor's programs, Virginia Tech offers graduate degrees in Construction Management. With more than 20,000 students, this institution is one of the largest schools in the nation. This school's student loan default rate of 1.4% is considerably below the U.S. average of 7.0%. This school's fair net price is quite appealing to cost-conscious applicants. Videos from Virginia Tech could be a great way to get more info on the school. John Brown University is one of the finest schools in the United States for Construction Management. Siloam Springs, Arkansas gives a charming small-town feeling for college students to study in. John Brown University is well-known for the support of military personnel and is the 847 best in the nation for veterans. Since the average SAT score of John Brown University applicants is around 1,130, admissions officers can afford to be selective. Take a virtual tour for more information on JBU's campus. Any student who is interested in Construction Management has to look into University of Oklahoma Norman Campus. University of Oklahoma Norman Campus offers graduate degrees in construction management for those interested in an advanced degree. Located in Norman, Oklahoma, University of Oklahoma offers a safe and sound, suburban environment for college students. With 83.0% of the instructors working full time, students are certain to get lots of face time with instructors. University of Oklahoma is committed to helping students to succeed, as confirmed by their 39.7% on-time graduation rate. Want to learn a little more about University of Oklahoma Norman Campus' campus? Go on a virtual tour. University of Wisconsin - Stout is one of the finest schools in the United States for Construction Management. Students who enjoy a more slow-paced life will appreciate University of Wisconsin - Stout's location in the small town of Menomonie, Wisconsin. Considering 38.1% of UW - Stout's population is from outside Wisconsin, you are going to have a lot of opportunities to meet undergraduates from all over the continent. This institution has excellent value for students in Wisconsin. Videos from UW - Stout are a great way to get more info on the university. Louisiana State University and Agricultural & Mechanical College is a great choice for students pursuing a Construction Management degree. In addition to its bachelor's programs, Louisiana State University and Agricultural & Mechanical College offers graduate degrees in Construction Management. Based in Baton Rouge, Louisiana, this college is ideal for students who flourish in a city atmosphere. This school's rate of student loan default of 5.2% is far below the national average of 7.0%. For those who wish to carry on after earning a bachelor's degree, this school has grad programs available. For more information, check out the college scorecard. It's hard to find a better school than Washington State University if you want to study Construction Management. Pullman, Washington allows a whimsical small-town setting for students to study in. Around 31.0% of applicants submit ACT scores, with the average score being in the 23 range. Washington State University graduates are doing well in the world as they are way less likely to go into default on their student loans than graduates from other schools. Check out all of Washington State University's rankings to find out more. North Dakota State University - Main Campus is among your top options if you're planning on studying Construction Management. North Dakota State University - Main Campus offers graduate degrees in construction management for those interested in an advanced degree. Fargo, North Dakota is an ideal environment for individuals who relish the busy city life. The student body at North Dakota State University - Main Campus is extremely diverse and includes undergraduates from across 25 U.S. states and 40 nations around the world. You will obtain a lot for your education investment at North Dakota State University - Main Campus, because its net price of $18,474 is among the best values in the U.S.. Where is North Dakota State University - Main Campus doing the best? Check out all the school rankings. Clemson University is among your best bets if you're planning on studying Construction Management. Clemson University offers graduate degrees in construction management for those interested in an advanced degree. Clemson University is among the largest schools in South Carolina. Considering the fact that 7.0% of student loan borrowers have defaulted, Clemson's default rate of 3.2% is really good. The student body at Clemson University is remarkably diverse and includes undergraduates from over 42 U.S. states and 43 nations around the world. Obtain all of the essential details on Clemson by checking out their scorecard.